Looking for deals in Birmingham? Featuring a garden, Edgbaston Park Hotel and Conference Centre offers rooms in Birmingham, a 3-minute walk from Winterbourne House and Garden and 0.6 miles from University of Birmingham. Immaculate, very comfortable and great value. We needed to stay near the university and the location is spot on! Located in Birmingham, a 16-minute walk from Broad Street, The Edgbaston Boutique Hotel has a garden and rooms with free WiFi access. Lovely Art Deco design. Staff, room and facilities were excellent. 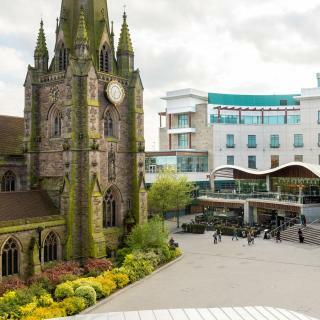 Just 5 minutes’ walk from the famous Bullring Shopping Center, Pentahotel Birmingham has a great location, less than 0.5 miles from Birmingham city center. The room was spotless and very clean, the beds were very cosy. Located 5 minutes’ walk from Birmingham city center, Hampton by Hilton Birmingham Broad Street features secure car parking, free WiFi and on-site dining. Bed feels like floating on a cloud! Offering ultra-modern décor, the BLOC Hotel’s rooms are inspired by Japanese space-saving design. Great location, comfortable bed, clean room, quiet neighbourhood. Boatel Birmingham is located right in the center of Birmingham, 656 feet from Broad Street. Friendly owner, comfy bed and great location. Set in the heart of Birmingham's commercial district, Birmingham Marriott Hotel offers stylish 4-star accommodations, close to the ICC. Comfortable, quiet and spacious room. Great location. The average price per night for a 3-star hotel in Birmingham this weekend is $184 or, for a 4-star hotel, $288. Looking for something even fancier? 5-star hotels in Birmingham for this weekend cost around $423 per night, on average (based on Booking.com prices). Which hotels in Birmingham are good for families? Many families visiting Birmingham loved staying at Ababeel Hotel, Staybridge Suites Birmingham, and The High Field Town House. What are the best hotels in Birmingham near Broad Street? 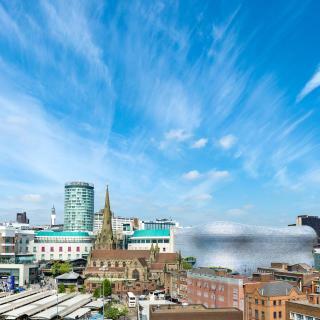 Some of the best hotels in Birmingham near Broad Street include AC Hotel Birmingham, A Marriott Lifestyle Hotel, Holiday Inn Express - Birmingham - City Centre and Hyatt Regency Birmingham. Which hotels are the best ones to stay at in Birmingham? Staybridge Suites Birmingham, AC Hotel Birmingham, A Marriott Lifestyle Hotel, and Holiday Inn Express - Birmingham - City Centre are some of the popular hotels in Birmingham. What are the best hotels in Birmingham near Birmingham Airport? Travelers who stayed in Birmingham near Birmingham Airport (BHX) have said good things about Novotel Birmingham Airport, ibis budget Birmingham International Airport – NEC, and ibis Birmingham International Airport – NEC. Which hotels in Birmingham are good for couples? These hotels in Birmingham are highly rated by couples: Staybridge Suites Birmingham, The High Field Town House, and The Edgbaston Boutique Hotel. Which hotels in Birmingham have nice views? Hotel Indigo Birmingham, Hyatt Regency Birmingham, and Radisson Blu Hotel, Birmingham got great room view-related reviews from travelers in Birmingham. On average, it costs $83 per night to book a 3-star hotel in Birmingham for tonight. You'll pay around $106 if you choose to stay in a 4-star hotel tonight, while a 5-star hotel in Birmingham will cost around $173, on average (based on Booking.com prices). How much does it cost to stay in a hotel in Birmingham? On average, 3-star hotels in Birmingham cost $83 per night, and 4-star hotels in Birmingham are $127 per night. If you're looking for something really special, a 5-star hotel in Birmingham can be found for $148 per night, on average (based on Booking.com prices). Which neighborhood is the best one to stay at in Birmingham? Jewellery Quarter, The Westside, and Convention Quarter are popular with other travelers visiting Birmingham. Which hotels in Birmingham offer an especially good breakfast? 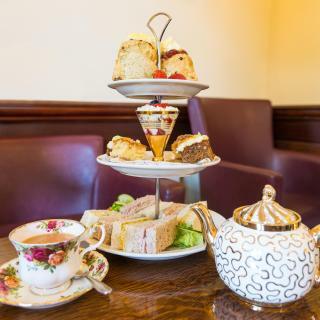 For hotels in Birmingham that serve highly-rated breakfasts, try The High Field Town House, Hotel du Vin Birmingham, and Edgbaston Park Hotel and Conference Centre. 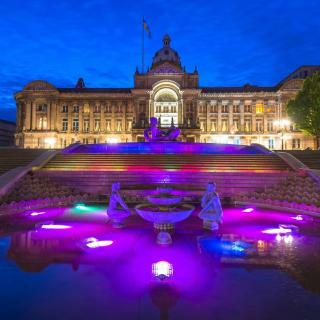 The UK's 2nd largest city, Birmingham is one of its top cultural centers. Well-known for its M6 Spaghetti Junction interchange, it's also a surprisingly green city with lots of open spaces. Most city center hotels in Birmingham are near New Street Station. To the east is the futuristic architecture of the new Bull Ring shopping center, and behind that is Digbeth Bus Station. To the west is Victoria Square, home of the town hall and a German Christmas Market. The Mailbox is one of the newest additions to the Birmingham shopping scene, and behind it is one of the canals converging on the Gas Street Basin. By one canal are the ICC (International Convention Center) and the NIA (National Indoor Arena), both venues that host major events. Just across the street is Brindleyplace, a canal-front complex of restaurants, bars and hotels near Broad Street – the main nightlife area. It is popular with students at nearby Birmingham University, whose clock tower is modeled on the one in Siena. Just south in Bournville is Cadbury World, and there are several hotels on Hagley Road to the north, which are available on Booking.com. The city is also known for sports – Aston Villa and Birmingham City are the top soccer clubs, while Edgbaston Cricket Ground hosts international matches. Other Birmingham attractions include Hockley’s Jewellery Quarter and the NEC arena by Birmingham International Airport. An interesting and diverse city. An interesting and diverse city. Great museums (especially the Back to Backs), architecture, restaurants (Balti Triangle and China town a must) and night life. Central area very easy to explore on foot. Edgbaston is lovely to walk around. Edgbaston is lovely to walk around. Plenty of good eateries. JW Evans workshop is worth a visit (English Heritage). Some interesting cemeteries if you like that sort of thing. Birmingham is becoming more hip and improvements are taking place in the city centre. Wanted to go to the Botanical Gardens, but there was an event on for half term and they wanted to charge us £12 each.. daylight robbery and not on!!!! Despite having grown up in the City, I left nearly 40 years ago. This was my first real look at the City centre for 35 years. I found an amazing modern City.but with the best of its history preserved. The old subways and dedication to the car have disappeared and the City is now full of people with more than adequate public transport. It feels like a safe place, comfortable with itself, confident in its future. I'd recommend looking at the superb Victorian brickwork on the old Law Courts and a walk along the canal off Broad Street. Great city - trip this time was for shopping and brief look around with teenage children. Previous trip to Birmingham did more museums and cultural activities- even teenagers were impressed with City library. This time we ate at grand central Holy Moly & Mowgli - both of which I’d really recommend. Previously we headed for Chinese quarter. Would recommend city museum including the cafe, the city library, the pen museum (quirky but it’s worth the walk) and then walk along canal between Mailbox and the Arena. 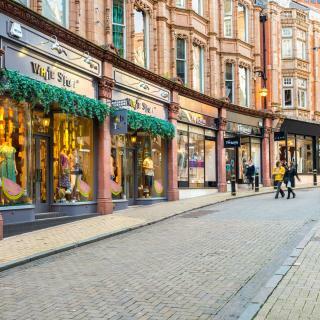 If you travel to England, Birmingham is one of the must go place. The night atmosphere is happening and the bull ring area was lovely especially during the Christmas season. When we stay at Britannia Hotel, almost everything is within walking distance and very easy to get around. The MUST try and buy is the baklava, Turkish delight, olives and many more that sold at a stall in the Bull Ring Mall itself. Another hidden gem is Makan Shawarma at the Square Shopping Centre, it is served halal food and not from there there is another fish and chips halal cafe too. We will definitely will go and visit Birmingham again to explore the outer city. I mostly liked my stay at the Hyatt regency Hotel and the company i was with. There are lots of places to eat round Birmingham it depends on what kind of food you would like to have but there is a nice quite little Indian place behind the hotel where we were staying which is called gateway to India. There is a lot changes happening in Birmingham so its not so easy to get around and if you not from Birmingham then its not that easy but you can still find your way around. I would recommend Birmingham for friends and family day trip for shopping restaurants etc. 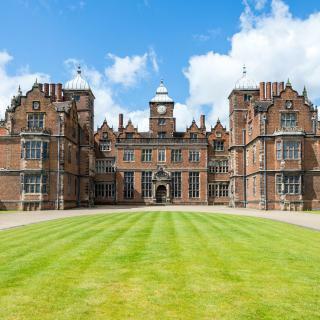 The property is part of Birmingham University and set in a quiet suburb. Great transport links and there is three buses available to/from Birmingham city centre that you can pick up/drop off right outside the hotel. Breakfast was excellent; great range of food items and piping hot. Staff very helpful and friendly. Rooms clean and on par with a “Premier Inn”. We had two rooms and my mother requested an accessible room which she was very happy with! Easy check in, free WiFi, free car parking with controlled access/exit. Room was a great size and very clean. Staff extremely helpful when being called upon. Really enjoyed our stay during Velo Birmingham and Hotel allowed bikes to be taken to rooms and set up early breakfast for the event which was very considerate. Location is good and only 15 minutes into a vibrant city centre. I especially loved the very grumpy drunk old man who came to fix our tv. He wasn't very happy to help. The one positive thing about the hotel is that a bus stop to go into Birmingham City centre is right outside of the hotel so transport to the centre was easy. Space and quietness. Near to University Station for commuting to the city centre. Hotel lobby has magnificent high ceiling. Windows look very grand. A stone throw away from the University of Birmingham. The surroundings are full of English Victorian charm. Excellently place for our purpose, very clean, good sized and comfortable room with really friendly staff. We went to the MAC by taxi from the hotel then a simple drive to the centre of Birmingham on the second day. Will certainly return to the Beeches. The hotel is lovely, in a really good spot, being close to Broad Street and the City Centre to be able to walk. The staff were extremely helpful and efficient. The room was clean and comfortable. We enjoyed our stay, and would definately come back. City centre! Cheap budget price for location! Don’t understand all the bad reviews, it’s the cheapest hotel you’d find, only a few bad points about it and considering it’s in the city centre surrounded by everything you need it’s hard to complain!! Great location for exploring Birmingham City Centre. Hotel was ideal for the short stay, very clean and well served. Straight forward check in and out. The hotel location was perfect for us to access the city centre and broad street easily. Staff we polite an friendly. Good location next to Birmingham New Street station. Pleasant and helpful staff. Very good hotel and very good price.